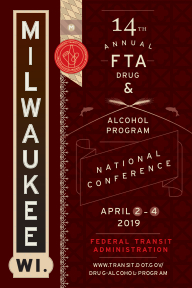 This FREE three-day Conference will provide attendees with a background on 49 CFR Part 40 (Procedures for Transportation Workplace Drug and Alcohol Testing Programs) and 49 CFR Part 655 (Prevention of Alcohol Misuse and Prohibited Drug Use in Transit Operators). The Conference will offer attendees the opportunity to choose from a variety of sessions, allowing each participant to customize their experience as they see best appropriate for the specific needs of their employer and knowledge level of the regulations. It will include training for beginner and advanced Drug and Alcohol Program Managers (DAPMs), various other sessions catered to running a compliant drug and alcohol program, networking opportunities, questions and answers with industry experts, an update from the Office of Drug and Alcohol Policy and Compliance (ODAPC), and many more. (617) 494-6336 or email us at FTA.DAMIS@dot.gov.